The March employment report brought a reversion to trend after recent distortions, both short-term and medium-term. The good-but-not-great survey of employers steered between the anomalously weak February report and the overheated January number. The household survey was significantly weaker, but markets were happy to overlook this, perhaps reassured by the prior run-up in labor force participation. 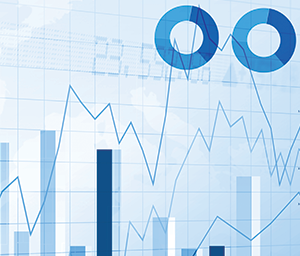 The combination of solid job growth and flattish wage growth supports the Fed’s “patient pause” on rate hikes, and that’s what’s really matters to most observers. Nonfarm payrolls rose by a better-than-expected 196k; upward revisions to the prior two months brought the 3-month average to 180k, with the weak February tally rising to just 33k from an initially-reported 20k. The unemployment rate was unchanged at 3.8%, as a slight decrease in the ranks of the unemployed was balanced by a drop in the labor force. Wage growth retraced to 3.2% from 3.4%. 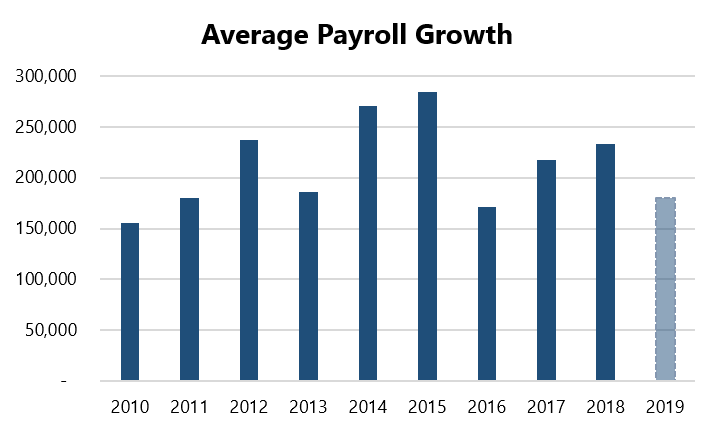 There’s often a bounce back in payroll growth after a slow month, but it’s notable that the March rebound was a modest one. In fact, it's a sign of how strong job growth has been that we now consider 196k merely reasonable or modest. That standard may shift in 2019 and 2020. Stepping back from the monthly volatility for a moment, this report suggests 2019 is bringing a return to trend for the labor market – slower than in the years of extra fiscal and monetary stimulus, but still well above the pace need to absorb to new entrants into the labor market. Note that the diffusion index rose back above 60, which is a good sign; it indicates that the breadth of job gains across industries was strong. In terms of individual industries, the rebounds in the construction (16k vs. -25k) and leisure/hospitality (33k vs. -1k) were a reminder of the effects of February’s cold weather. Retail trade continues to shed jobs (-12k vs. -20k), but bigger concerns for the economy as a whole were the decline in temporary jobs and manufacturing. The former (-5k vs. 3k) was the second loss in three months, but there were similar patterns in 2016 and 2017, so this fits with the an economy that is slowing but not stalling. The losses in manufacturing (-6k vs. 1k) were more concerning. They likely reflect layoffs at GM, but they could also indicate that manufacturer confidence is buckling amid trade tensions and weakness in hard manufacturing data. While the wage numbers were disappointing, they also make it easier for the Fed to hold rates steady without fretting about inflation. Not that this is a time to get complacent – we should expect a few bumps along the upward path for wages, especially since the last two months’ volatility in weekly hours has also contributed to the up-and-down in hourly wages. Also notable was the fact that gains among lower-wage industries and occupations continued to outpace others (3.3% over 12 months for production/non-supervisory vs. 3.2% for all employees), as they have since November 2018. Both these rates are well above inflation, so that’s a good sign for consumer spending. The household survey was widely acknowledged as weak in the details, despite the stable headline number. Much attention went to the decline in labor force participation, which erased several months of gains (63.0% vs. 63.2% prior), as well as in the employment-to-population ratio. Duration of unemployment was discouraging. Short-term unemployment was the only category to decline, while there was a significant rise for the long-term unemployed. Evidently, even people who just came off the sidelines to look for a job are beating out the long-term job seekers. The “U6” under-employment rate (7.3%) held stable, but other silver linings were hard to find.